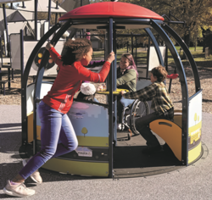 Delano, Minn. (PRWeb) February 11, 2019 -- Expanding on its line of inclusive playground products, Landscape Structures Inc., a Delano, Minn.-based commercial playground equipment manufacturer, has introduced the We-Go-Round™, a merry-go-round-like spinner designed to accommodate children and families of all abilities. There is ample room for wheelchairs inside the We-Go-Round, and strategic seating areas position everyone toward the center to share smiles, laughter and conversation while in orbit. The patent-pending We-Go-Round is the perfect inclusive solution. The base is flush with surrounding surfacing for easy access for those using mobility devices. Under rooftop shade, riders can participate in the action using the center handhold while others are turning from the outside. Plus, Landscape Structures’ built-in progressive resistance mechanism maintains a reasonable maximum speed, ensuring all spins on the We-Go-Round remain within the fun zone. Landscape Structures is committed to providing play experiences for children of all abilities. With its design philosophy, which addresses the accessibility, age and developmental appropriateness, and sensory-stimulating activity, and other inclusive play product innovations like the We-Saw™, OmniSpin® spinner and Sway Fun® glider, the company helps bring children with and without special needs together to play, learn and grow on the playground. See the We-Go-Round in action and learn how to bring this next-generation merry-go-round to your community at playlsi.com. Since 1971, Landscape Structures Inc. has been the leading manufacturer of commercial playground equipment in the world. Our employee-owned company designs community and school playgrounds that encourage kids of all ages and abilities to learn persistence, leadership, competition, bravery, support and empathy through play. We push the limits — of design, inclusion, play — to help kids realize there is no limit to what they can do today and in the future. For a better tomorrow, we play today.